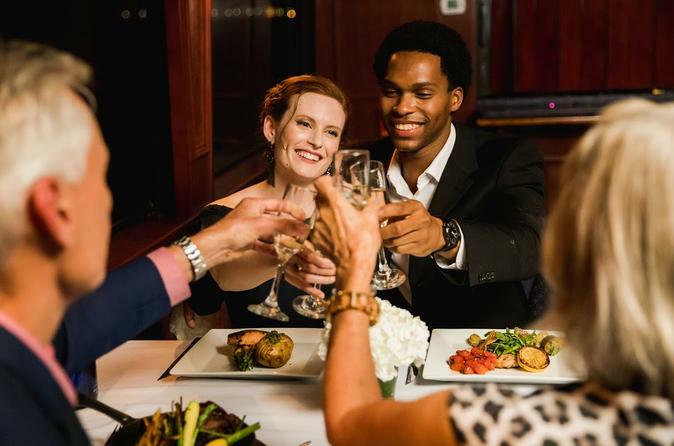 Aboard your dinner cruise in NYC, you’ll enjoy a decadent three-course meal and artisan cocktails prepared by our very own culinary veterans. Experience after-dinner dancing on the river to our live, award-winning onboard DJ. Take in the sights of NYC’s iconic landmarks from our climate-controlled sun deck, and get up close and personal with lovely Lady Liberty for a special photo-opportunity you can’t get on land! Your dinner cruise around Manhattan and the rest of the beautiful city awaits! Upgrade for a private window table with Champagne — a Viator Exclusive available nowhere else! Make your way to Manhattan's Hudson River Park in the evening to embark on your 3-hour dinner cruise. As your 3-tiered yacht departs down the Hudson, bite into hors d’oeuvres served during a reception, then take a seat at your table and gaze out the panoramic windows at the New York City skyline illuminated at dusk. Select from an à la carte menu and sit back as the professional waitstaff delivers you a customized 3-course meal. Selections may include filet mignon, pan-seared salmon and chicken with truffle potatoes, followed by a decadent dessert assortment (see below for a full sample menu). The DJ music picks up after dinner, so purchase a drink from the cash bar and show off your dance moves on the dance floor, or head outside to be dazzled by the New York City sights. Get unobstructed nighttime views of the Statue of Liberty, Ellis Island, the Brooklyn Bridge and more from the top deck. Your dinner cruise concludes back at Pier 40. Optional Upgrade: Viator ExclusiveTreat yourself and a loved one to your own private window table that guarantees unobstructed views of the dazzling city. Enhance your dining experience with one complimentary bottle of Champagne per couple. It's an option only available on Viator!